The number of single-use plastic bags used by shoppers in England has plummeted by more than 85% after the introduction of a 5p charge last October, early figures suggest. More than 7bn bags were handed out by seven main supermarkets in the year before the charge, but this figure plummeted to slightly more than 500m in the first six months after the charge was introduced, the Department for Environment, Food and Rural Affairs (Defra) said. The data is the government’s first official assessment of the impact of the charge, which was introduced to help reduce litter and protect wildlife – and the expected full-year drop of 6bn bags was hailed by ministers as a sign that it is working. The charge has also triggered donations of more than £29m from retailers towards good causes including charities and community groups, according to Defra. England was the last part of the UK to adopt the 5p levy, after successful schemes in Scotland, Wales and Northern Ireland. Around 8m tonnes of plastic makes its way into the world’s oceans each year, posing a serious threat to the marine environment. Experts estimate that plastic is eaten by 31 species of marine mammals and more than 100 species of sea birds. The environment minister, Therese Coffey, said: “Taking 6bn plastic bags out of circulation is fantastic news for all of us,. It will mean our precious marine life is safer, our communities are cleaner and future generations won’t be saddled with mountains of plastic taking hundreds of years to breakdown in landfill sites. The charge was introduced to try to influence consumer behaviour after the number of carriers bags given out by seven major supermarkets in England rose by 200min 2014 to exceed 7.6bn – the equivalent of 140 per person and amounting to a total of 61,000 tonnes of plastic. Tesco expects its Bags of Help scheme to provide more than £20m in the first year to local environmental projects. Plastic bags can take hundreds of years to break down, but plastic drinks bottles and disposable coffee cups are now being seen as a huge challenge in protecting the environment. The results of the Marine Conservation Society’s annual beach cleanup in 2015 showed that the amount of rubbish dumped on UK beaches rose by a third compared with the previous year. The number of plastic drinks bottles found were up 43% on 2014 levels. At the time of the launch, the government forecast that the charge would reduce use of single-use carrier bags by up to 80% in supermarkets and 50% on the high street. It is also expected to save £60m in litter cleanup costs. • 6bn single use plastic bags would cover an area of about 900,000,000m2, over three times the area of Birmingham. • 6bn bags laid end-to-end it would stretch about 3m km, or 75 times around the world. • 6bn bags are approximately equivalent to the weight of 300 blue whales, 300,000 sea turtles or 3m pelicans. Written by Zero Waste Europe Policy Officer, Delphine Lévi Alvarès after experiencing the incredible amount of plastic waste on beaches in the Philippines. On the morning of Saturday 16th of July some of Zero Waste Europe’s staff took part in their first Philippines beach cleanup. It was only 8am, and a swarm of volunteers were already in action on Freedom Island’s beach, armed with bags and gloves to clear the sand from layers and layers of garbage carried downstream into the Manila bay from all the small canals and rivers crossing the megalopolis. Our first impression when we arrived at the beach was shocking. It was almost uniformly covered by little used sachets of shampoo, detergent, and instant coffee… an ocean of colours and brands among which many were recognised by the sharp eye of a western consumer. Nescafé, Maggi, Ariel, Palmolive, Colgate, Head & Shoulders, Mentos and many others, directly coming for the marketing brains of American and European multinationals such as Nestlé, Procter & Gamble and Unilever. Why such a flow of single use sachets in this region of the world, to package the same products that we have in bigger containers in Europe and the US, and how do they end up in the rivers and the ocean? Speaking with our colleagues from South East Asia, we understood that behind the false affordability (the so-called ‘pro-poor’) argument made by the companies manufacturing these products (i.e. that for people with low income it is cheaper to buy these products on a daily basis than buying larger quantities despite the fact that the total cost they will end up paying is higher) there is a more significant marketing argument. Hence the appealing colours and glossy packaging. And even if it’s not part of their strategy, the absence of sound waste collection and management systems in most of the places where people use these sachets leads to massive littering both on land and in waterways increasing their brand’s visibility even more than the market stalls. Yet the solutions to replace these sachets exist and many Zero Waste groups have been promoting them in front of these brand’s corporate leaders. In low-income areas they should be replaced by dispensers from which people could get one pump of their required product (oil, shampoo, detergent, etc.) in small returnable and reusable containers. It would be even cheaper to buy on a daily basis, because a large part of the product’s price is in the cost of the packaging itself. Improving the waste management systems in these areas is of course of high priority, but in regardless case it’s better to prevent than manage waste, and even more so because these sachets, made of multilayered material, are not recyclable. The response of the brands to this proposal has been a resounding ”no”. It is necessary for the producers to take responsibility for the products they put in the market and if they are sold in places where the means to manage this waste are not available they should -at the very least- shoulder the costs of collecting and treating this waste. If they do it in Europe, why can’t they do it in Asia? Every month this year has set a new record high temperature for the month, continuing a streak that now extends over 14 months. “What concerns me most is that we didn’t anticipate these temperature jumps,” Dr Carlson told the Thomson Reuters Foundation. “We predicted moderate warmth for 2016, but nothing like the temperature rises we’ve seen. The WCRP was set up by the International Council for Science and the World Meteorological Organization in 1980. Scientists have expressed concerns at a number of tipping points that could dramatically increase the rate of warming. For example, the melting of ice at the poles reduces the amount of sunlight that is reflected with the darker water or land absorbing more of the sun’s energy and increasing the temperature. Experts have warned the warming in the Arctic – far higher than the global average – could have a “possibly catastrophic” effect on the number of dangerous storms in the northern hemisphere. Vast amounts of methane – a powerful greenhouse gas – that has been frozen for thousands of years in the tundra of Siberia has also started to be released as it melts. Methane has also been seen bubbling to the surface in the ocean off the northern coast of Russia following dramatic reductions in sea ice cover. And Dr Carlson said the way humans react to warmer weather could make things worse. “Also critical is the fact that people survive the heat by using more energy for cooling, thus further depleting the world’s resources,” he said. He said the increased frequency of extreme storms was starting to attract world leaders’ attention. “The question is shifting from ‘has the climate changed?’ to ‘by how much?’” he said. The Environmental Audit Committee (EAC) has set a September deadline for the new Secretary of State for Exiting the European Union (EU) David Davis, and new Minister for the Environment Therese Coffey to reveal how they plan to handle environmental policies during exit negotiations. A letter from Labour MP and EAC chair Mary Creagh has called on the two ministers to deliver oral evidence at House’s September sitting as to how negotiating a deal to leave the EU will impact environmental policies such as air quality, water pollution and waste management. “The Committee is particularly concerned and wishes to seek reassurance about the Government’s plans for the large proportion of UK environmental law that originated from EU level, the Government’s approach to ongoing negotiations around EU measures such as the Circular Economy Package and how the Government intends to maintain the benefits of transnational cooperation on environmental issues such as climate change,” Creagh said in the letter. In the letter, which arrived just weeks after an inquiry on how Brexit would affect UK climate policy was launched, Creagh noted that the EU had implemented a “widespread impact on the environment” with many of the legislative measures covering the environment and climate change established at EU level. Creagh also alluded to recent ONS figures, which show that the UK’s low-carbon and renewables economy was worth £46.2bn and supported nearly 250,000 jobs, as a reason why there are concerns that the Government may “deprioritise the issue”. The letter claimed that business investors required “stability” and that the Brexit strategy should provide evidence on how the UK plans to tackle its worsening air quality levels and its “poor quality” water sites. A blueprint should also be provided on how the UK plants to improve biodiversity protection, which is likely to be secured through a new €12m MoorLIFE 2020 project. The letter also calls on the ministers to provide evidence on how any policy changes or amendments would secure the current platform that has allowed the UK to “show global leadership on climate change”. Last month, former Energy Secretary Amber Rudd reassured delegates at the Business and Climate Summit that post-Brexit Britain would not step back from climate leadership. Commenting on the letter, Friends of the Earth Campaigner Sam Lowe said: “It is essential that the government upholds current EU protections for our nature and wildlife and looks to improve them. With over 70% of our environmental laws coming from Europe, the government must urgently clarify its intent to create UK rules which will fully protect our environment. The Circular Economy Package – which includes 65% recycling targets, tools to halve food waste by 2030, and measures to promote reparability in the design phase of products – has been one of the biggest areas of uncertainty surrounding the UK’s ability to trade products outside of a Member State status. Speaking exclusively at edie’s Resource Revolution event earlier this month, chair of the UK’s Circular Economy Taskforce Sue Armstrong-Brown said the only way for Britain to open up trading streams with the EU after it leaves the bloc will be to create much more recyclable, repairable and reusable products and services. However, there are concerns that Brexit could lead to the collapse of the UK’s plateauing recycling rates. Europe is becoming increasingly dependent on farm land beyond its borders, creating inequalities and threatening both the environment and rural communities, according to a new report released today by Friends of the Earth Europe. The report reveals that the European Union requires almost 270 million hectares of agricultural land – known as Europe’s ‘Land Footprint’ – to sustain its unsustainable food production and agricultural practices. Almost 40% of this land is outside Europe, an area the size of Italy and France combined . The report also reveals the knock-on impacts of over-reliance on imported animal feed and year-round seasonal goods, and surging demand for vegetable oils, particularly those for non-food uses such as biofuel – with a 34% increase in cropland consumed from outside the EU since 1990. Animal products like meat and dairy account for over 70% of the overall land requirements, and non-food crops like biofuels are linked to negative social impacts on local communities and environmental impacts, including forest loss. Friends of the Earth Europe is calling on the European Union to reduce its land footprint, and the associated harmful impacts, ensuring that our use of land is environmentally sustainable and socially just. This can be achieved by implementing a system for measuring, monitoring and reducing Europe’s land footprint, especially in the areas of bio-economy, circular economy and sustainability policies. Providing incentives that encourage a reduction in the consumption of land intensive products or products that embody relatively high environmental impacts like animal products will also drastically reduce Europe’s land footprint, according to the organisation. 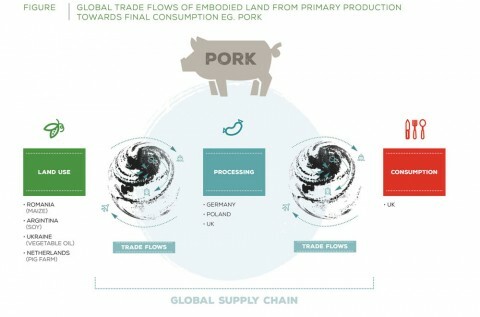 The “Land Footprint” as referred to above, and in the report, refers to agricultural land only (cropland and grassland). Due to current data limitations, EU-wide Land Footprints for non-agricultural products are not possible to calculate. Mary Creagh MP, Chair of the Environmental Audit Committee (EAC), wrote to Brexit Secretary David Davis and new Environment minister Therese Coffey to seeks assurances about plans for the large proportion of UK environmental law that originates from the EU. Following a public inquiry completed earlier this year, the EAC concluded that the EU had been ‘crucial’ in shaping British environmental policy and helping the UK lose its moniker as ‘the dirty man of Europe’. Davies was given the new role Secretary of State for Exiting the European Union during Theresa May’s governmental reshuffle earlier this month, which also saw Coffey join the Department for the Environment, Food & Rural Affairs (Defra), replacing Resources Minister Rory Stewart, though her role at the department has yet to be formally confirmed. Both ministers have been invited by Creagh to provide oral evidence to the EAC when Parliament reconvenes in September to explain how the government intends to approach environmental issues during the Brexit negotiations. In particular the committee wants to hear about plans for the environmental law that was derived from the EU and the government’s approach to EU-wide initiatives like the Circular Economy Package, which is seeking to facilitate a more resource-efficient way of life and is currently working its way around the European institutions for ratification. Ministers from Defra told the inquiry that little had been planned for the eventuality that Britain might vote to leave the EU prior to the referendum in June, but did warn that a vote to leave would trigger a ‘long and tortuous negotiation’ over environmental laws and industries. Creagh’s letter reads: ‘There are few areas of government policy where the decision to leave the European Union will have a more widespread impact than the environment. The EAC’s report stated that EU membership has ensured that environmental action in the UK has been taken on a faster timetable, and ‘if the UK were free to set its own environmental standards, it would set them at a less stringent level than has been imposed by the EU’. It also pointed to the lack of air pollution action taken prior to EU air quality limits. One of the main worries of the majority of the waste and resources industry prior to the referendum was what impact Brexit would have on investment in infrastructure, both in the long and short term.